Granny Snows A Sneak To Be Released Soon! 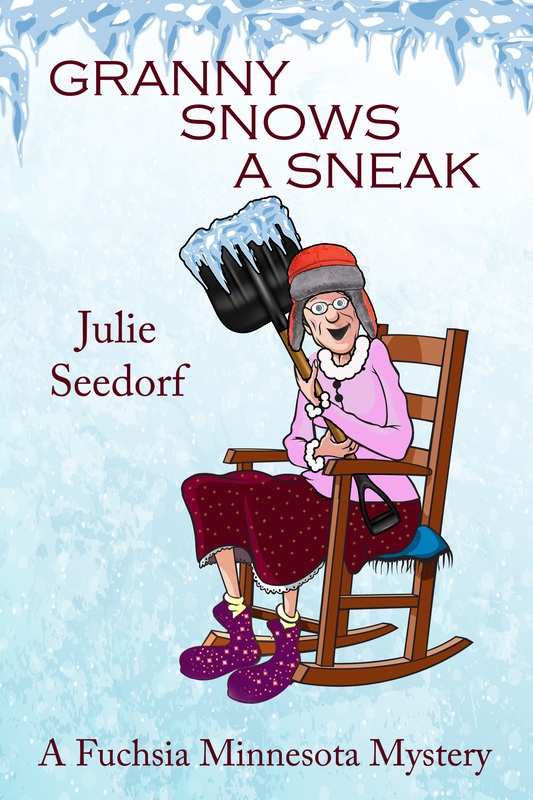 JULIE SEEDORF’S new book GRANNY SNOWS A SNEAK, the next book in the Fuchsia, MN Series published by Cozy Cat Press will be out soon. Here is a little sneak peak at the story. Author Julie Seedorf is a columnist, author and dreamer. She lived her live as a wife and mom, experiencing various careers including that of computer technician, retiring from her computer repair business in January of 2014 to follow her dream and transition to that of full-time writer. Beside her Fuchsia, Minnesota Series, she is the author of the Granny’s In Trouble Series bringing mystery to the life of young readers along with sharing who Granny is under the wrinkles, so her grandchildren will always know that Granny can be forever young. Her column Something About Nothing, is written with the idea that under the nothings we all talk about there is a hidden something waiting to get out. Dead bodies. Dead bodies in other people’s clothes. Dead bodies where they don’t belong. And two weddings coming up. Granny does not need this! Ms Seedorf has hit it out of the park with GRANNY SNOWS A SNEAK. I’ve called this series like Lemony Snicket for adults. And it still is. But this time out we see another side of Granny. We see her in her family life instead of her “professional life” as a snoop for the big guy. Well her family life is just as crazy. And with a wedding to Franklin just days away, a new man enters her life. Of course they hate each other… there’s a fine line… Anyway, prepare yourself for an all-nighter because once the action starts, you won’t be putting down GRANNY SNOWS A SNEAK until you are done. To learn more about Julie’s books visit her at these addresses: http://www.julieseedorf.com, her blog: http://sprinklednotes.com. Facebook page: http://www.facebook.com/julie.seedorf.author or on Twitter at julieseedorf@julieseedorf. You can also catch up with Granny at http://www.facebook.com/grannyfromfuchsiaminnesota and watch for more updates on the release of the book on http://www.cozycatpress.com. And…..feel free to share this with your friends so they don’t miss out on the release of Julie Seedorf’s new book, Granny Snows A Sneak. Tags: Albert Lea Tribune, amazon, Author, Cozy Cat Press, Fuchsia, Granny Hooks A Crook, Granny Skewers A Scoundrel, Granny Snows A Sneak!, Julie Seedorf, Something About Nothing, Sprinkled Notes, The Courier Sentinel, Whatchamacallit? Thingamajig? Previous It’s All In The Service, Customer Service That Is. Next GRANNY SNOWS A SNEAK IS HERE!